Andy Gracie and Brian Lee Yung Rowe, Autoinducer pH-, 2006. Photo: Gailen Manuel. 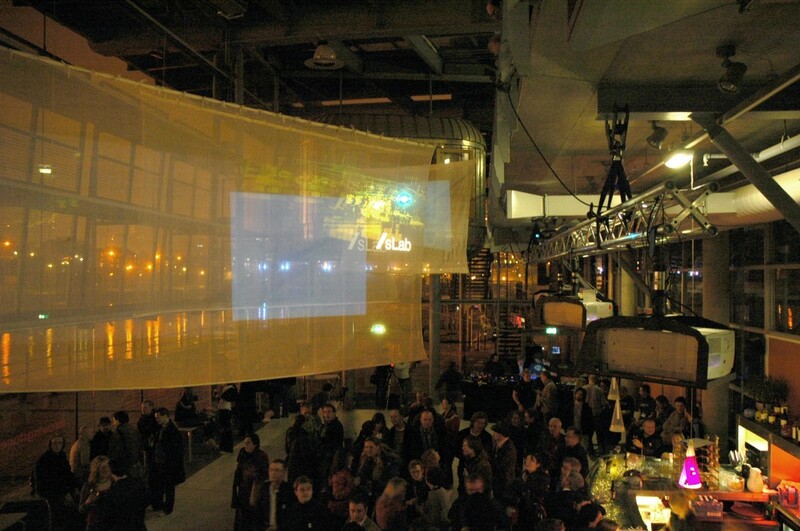 Courtesy of AV Festival 06. Anthony McCall, Swell, 2006. Photo: Reg Vardy Gallery. Courtesy of AV Festival 06. 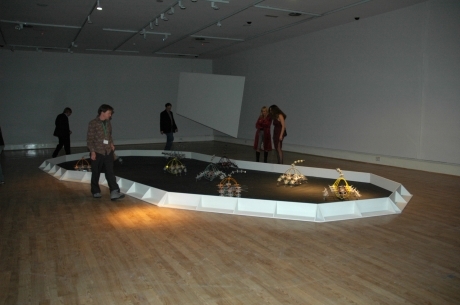 D-fuse, Undercurrent, 2006. Photo: Gailen Manuel. Courtesy of AV Festival 06. This special evening launched all of the AV Festival 06 exhibitions in Sunderland. 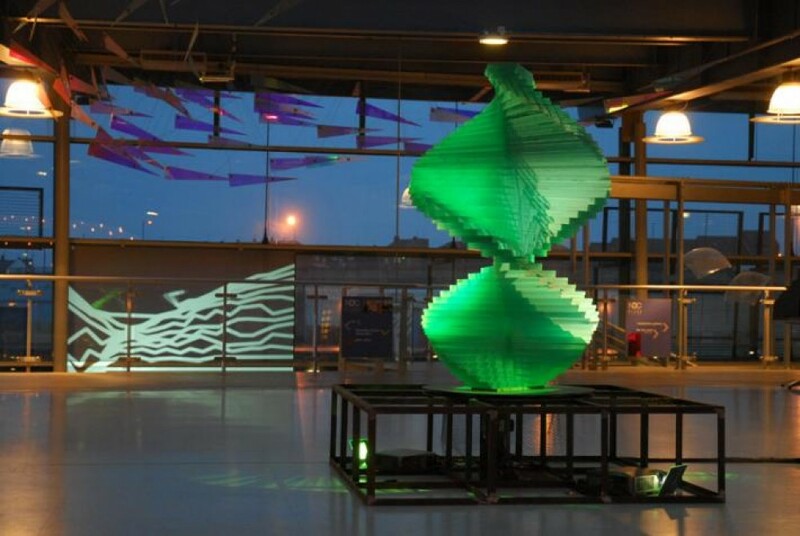 A tour of all four exhibitions and commissions was followed by a party at the National Glass Centre including the world premiere of a new audiovisual performance by the global design collective D-Fuse. AV Passholders travelled for free to each opening reception via the AV Bus. 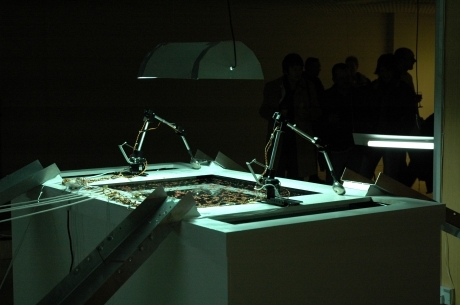 AV Festival 06 has commissioned the eminent media artist Ken Rinaldo to make a new artificial life installation The Autotelematic Spider Bots. A gaggle of 2ft x 1.5ft ‘Spider Bots’, made from plastics and electronics look like spiders, search for food like ants, see like bats and communicate like twittering birds. The robots are programmed to interact and react with audience and even have the power to activate your phone. autoinducer PH-1 is an eco-system made up of three pool systems mediated and manipulated by a brand new artificial intelligence programme. The first pool houses azolla water ferns, another has an artificial indoor rice paddy, and the third has culture chambers of blue-green algae - bacteria on the cusp between plant and animal that helps azolla thrive. The three different aquatic environments are all connected, relating and interacting with each other. AV Festival 06 are proud to have co-commissioned a new work by one of Britain’s most acclaimed visual artists, Anthony McCall. 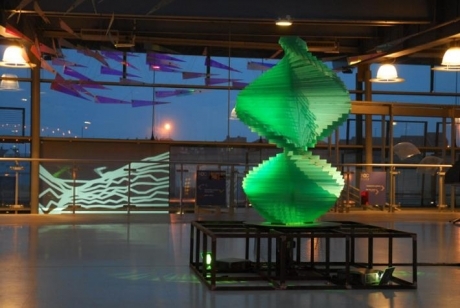 Swell is a fifty-foot horizontal projection inspired by the North East coastal landscape. Situated at the meeting-place of sculpture and cinema, this new work draws the visitor into a three-dimensional envelope of projected ‘solid light’. The inspiration for Swell came after the artist took a stroll on the coast near the Roker Lighthouse whilst in town visiting the Reg Vardy Gallery. The resulting work focuses on the phenomenological force of projected waves of white light, recalling the rolling waves of an ocean. The air of the gallery is filled with a sea-mist-like haze, which reveals the projected beam as a palpably present, three-dimensional form of astonishing beauty. 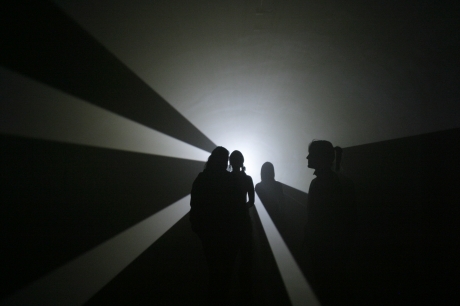 Unlike a conventional film or video, the audience can move around the space, finding their own perspectives as the room-sized membranes of light rise and fall and turn through space, and one another. Trip the Light Fantastic explores the theme of light. The ubiquitous yet elusive qualities of light have been a constant fascination to artists. From the dramatic chiaroscuros of early baroque painting to the Impressionists’ obsessive documentation of natural light patterns; to Minimalist neon sculptures, projected lightworks and the experimental Light Shows of the 1960s that accompanied psychedelic gigs and club events. This new exhibition brought together a group of five British artists and designers who, working with glass, light, sound, mixed media and animation, continue this legacy in their contemporary practice. Including artists: Kate Owens, Katy Dove, Martin Richman and The Illustrious Company. D-Fuse presented their new work Undercurrent as the closing event of the Festival’s Sunderland launch night. Undercurrent is a multi-screen live audiovisual extravaganza, projected across the walls of the National Glass Centre. It explores the changing nature of urban life in China and the UK, inspired by Shanghai, Guangzhou, London and Sunderland. D-Fuse follow rivers as a medium for travel, transport, trade and communication, exploring and documenting the urban spaces they find along the way, in sound, photography and video. The resulting work captures the emotions, histories and stories of each city.